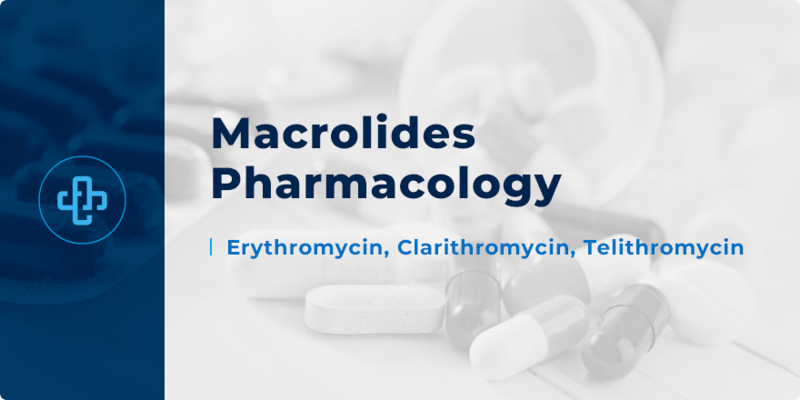 Macrolides Pharmacology | All the Facts in One Place! Macrolides are among the most widely prescribed antibacterial drug classes; an effective drug class with activity against a broad range of organisms. Macrolide antibacterial drugs have been around since the 1950s and have, since that time, proved enormously successful at treating bacterial infections. Macrolides are predominantly used to treat Gram-positive infections and remain a popular alternative for patients with penicillin allergy. They are active against a limited range of Gram-negative organisms (B. pertussis, H. influenzae etc.). Let’s take a few moments to learn more about how macrolides pharmacology; how they exert their therapeutic impact. Macrolide antibacterial drugs are protein synthesis inhibitors. More specifically, macrolides prevent elongation of the polypeptide chain – an effect achieved through their reversible binding to the P site of the 50S ribosomal subunit. Their mechanism of action has a bacteriostatic effect – that is to say, they prevent bacterial growth, allowing the body to take over and eliminate the bacterial infection. Erythromycin was the first macrolide and is associated with less activity against Gram-negative organisms compared to later, synthetic macrolides – such as azithromycin and clarithromycin. Macrolides are associated with their own range of potential side effects. Gastrointestinal effects are more serious with erythromycin because it acts as a motilin agonist. Other potential side effects include cholestatic jaundice, QT prolongation and, at high doses, ototoxicity. That macrolides interact with statins to increase the risk of serious myopathy. That macrolides should be used with caution in patients taking other medicines that prolong the QT interval – quinolone antibacterials, antipsychotics, SSRIs and amiodarone, for example. That macrolides increase the risk of bleeding in patients taking warfarin. That later macrolides, such as clarithromycin, are associated with fewer adverse effects compared to earlier macrolides, such as erythromycin. That macrolides are often given alongside penicillins to treat pneumonia. Macrolides cover atypical organisms – such as Legionella and Mycoplasma – that penicillins do not cover. That macrolides are often given alongside other antibacterial agents – such as amoxicillin and omeprazole – in the treatment of pylori infection. That macrolides should not be prescribed to patients who have a positive history of hypersensitivity to macrolide antibacterial agents. They are often used as an alternative where patients are allergic to penicillins. That erythromycin has gastroprokinetic effects – part of the reason why its gastrointestinal side effect profile is more pronounced. That macrolides are mostly eliminated via the hepatic route. Caution is needed in patients with severe hepatic impairment. A dose reduction may be required in patients with renal impairment because a small amount of macrolide is eliminated by this route. That both erythromycin and clarithromycin, but not azithromycin, inhibit CYP3A4 and consequently impact the metabolism of a wide range of medicines. Their effect on CYP3A4 is responsible for the effects on warfarin and statins mentioned above. That macrolides, such as erythromycin, are inactivated by gastric acid – meaning their oral formulation is given as an enteric-coated agent or as a more stable ester. Macrolides remain an important antibacterial drug class – predominantly used to treat Gram-positive but also a limited range of Gram-negative infections. Though resistance is increasing, their clinical impact has never been more relevant. Want to learn more macrolides pharmacology? Register with PharmaFactz today to receive instant access to all the resources you need – quiz questions, flashcards, mnemonics and much more. In the meantime, take a few moments to join our pharmacy blog newsletter (above) to receive all the latest facts direct to your email.